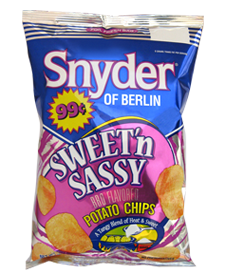 These glossy Regular Chips designs by Snyder of Berlin are all different. Flavor color coding is not a prime requisite, which it should be. A balance of fonts and text sizes is not balanced. The imagery is old fashioned or fussy. Even the popular matt bags of forward thinking rivals has been eschewed for ultra glossy bags. As part of one of the United States biggest snack food producers you would think a design company will be employed at vast cost to design something obvious and simple at some stage in the near future. There is actually a picture of a spoon pouring sugar into these Chips - OMG ! ! ! With so many flat Chips in the bag it was tempting to try a Snap Test. The Chip won - a slowly bent Chip broke in half neatly, with no splintering. These were thicker than many original style Chips, with very little oil to weaken the crunch. They were firm and robust, a bit like a Ridged Chip. These were thick and crispy Chips, with little to no oil bubbling to create any sort of rugged surface. In fact, so lacking in texture, the Chips relied upon the unevenly sprinkled Barbecue seasoning to provide character. There were also a few broken Chips in the bag. As referred to above, there is a spoonful of sugar being graphically added to the Chips on the bag graphic. This obviously conjures up an image of something no-one should buy! To Snyder of Berlin's credit they are merely being honest. These are very sweet Barbecue Chips. They taste virtually the same as Snyder's Original Barbecue flavor, but a little less hot and a little more syrupy.